tombs found in the Valley of the Kings. Tutankhamun's tomb had been entered at least twice not long after his mummy was buried, and well before Carter's discovery. The outermost doors of the shrines enclosing the king's nested coffins were unsealed, though the inner two shrines (three and four) remained intact and sealed. In 1907, just before his discovery of the tomb of Horemheb, Theodore M. Davis's team uncovered a small site containing funerary artifacts with Tutankhamun's name and some embalming parts. 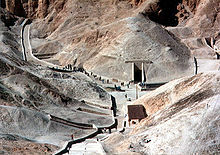 Erroneously assuming that this site, numbered finally as KV54, was Tutankhamun's complete tomb, Davis concluded the dig. The details of both findings are documented in Davis's 1912 publication, The Tombs of Harmhabi and Touatânkhamanou; the book closes with the comment, "I fear that the Valley of the Kings is now exhausted." But Davis was to be proven spectacularly wrong. The British Egyptologist Howard Carter (employed by Lord Carnarvon) hired a crew to help him excavate at the site of KV62. Carter went back to a line of huts that he had abandoned a few seasons earlier. After the crew cleared the huts and rock debris beneath, their young water boy accidentally stumbled on a stone that turned out to be the top of a flight of steps cut into the bedrock. Carter had the steps partially dug out until the top of a mud-plastered doorway was found. The doorway was stamped with indistinct cartouches (oval seals with hieroglyphic writing). Carter ordered the staircase to be refilled, and sent a telegram to Carnarvon, who arrived two-and-a-half weeks later on 23 November along with his 21-year-old daughter, Lady Evelyn Herbert. The excavators cleared the stairway completely, which allowed clearer seals lower down on the door to be read, seals bearing the name of Tutankhamun. However, further examination showed that the door blocking had been breached and resealed on at least two occasions. Clearing the blocking led to a downward corridor that was completely blocked with packed limestone chippings, through which a robbers' tunnel had been excavated and anciently refilled. At the end of the tunnel was a second sealed door that had been breached and re-sealed in antiquity. Carter then made a hole in the door and used a candle to check for foul gases, before looking inside. "At first I could see nothing," he would later write, "the hot air escaping from the chamber causing the candle flame to flicker, but presently, as my eyes grew accustomed to the light, details of the room within emerged slowly from the mist, strange animals, statues, and gold — everywhere the glint of gold." After a pause, Carnarvon asked, "Can you see anything?" Carter famously replied, "Yes, wonderful things..."
The first step to the stairs was found on November 4, 1922. The following day saw the exposure of a complete staircase. The end of November saw access to the antechamber and the discovery of the annex, and then the burial chamber and treasury. On November 29, the tomb was opened, and the first announcement and press conference followed the next day. The first item was removed from the tomb on December 27. On February 16, 1923, the burial chamber was opened, and on April 5, Lord Carnarvon died. On February 12, 1924, the granite lid of the sarcophagus was raised. In April, Carter argued with the Antiquities Service and left the excavation for the United States. In January 1925, Carter resumed activities in the tomb, and on October 13, he removed the cover of the first sarcophagus; on October 23, he removed the cover of the second sarcophagus; on October 28, the team removed the cover of the final sarcophagus and exposed the mummy; and on November 11, the examination of the remains of Tutankhamun started. Work started in the treasury on October 24, 1926, and between October 30 and December 15, 1927, the annex was emptied and examined. On November 10, 1930, eight years after the discovery, the last objects were removed from the tomb. In design, the tomb appears to have originally been intended for a private individual, not for royalty. There is some evidence to suggest that the tomb was adapted for a royal occupant during its excavation. This may be supported by the fact that only the burial chamber walls were decorated, unlike royal tombs in which nearly all walls were painted with scenes from the netherworld books. Starting from a small, level platform, 16 steps descend to the first doorway, which was sealed and plastered, although it had been penetrated by grave robbers at least twice in antiquity. Beyond the first doorway, a descending corridor leads to the second sealed door, and into the room that Carter described as the antechamber. This was used originally to hold material left over from the funeral and material associated with the embalming of the king. After an initial robbery, this material was either moved into the tomb proper, or to KV54, and the corridor was sealed with packed limestone chippings which covered some debris from the first robbery. A later robbery broke through the outer door and excavated a tunnel through the chippings to the second door. The robbery was discovered and the second door was resealed, the tunnel refilled, and the outer door sealed again. Some remnants in the corridor appear to have been from a funerary meal matching one discovered by Davis in jars in KV54, which indicates that KV54 may have been used as a store for items recovered after the first resealing of the tomb. Carter said that he found the Head of Nefertem in this section. The undecorated antechamber was found to be in a state of "organized chaos", partly due to ransacking during the robberies, and contained approximately 700 objects (articles 14 to 171 in the Carter catalogue) amongst which were three funeral beds, one decorated with the heads of lions (the goddess Mehet), one with the heads of spotted cattle (representing the great flood, or Mehet-Uret) and one featuring a composite animal with the body of a lion, the tail of a hippopotamus, and the head of a crocodile (representing the corpse-devourer Ammit). Perhaps the most remarkable item in this room were the components, stacked, of four chariots of which one was possibly used for hunting, one for "war" and another two for parades. A large chest was found to contain military items, walking sticks, the king's underpants and a copper alloy trumpet – one of two trumpets found in the tomb, the oldest functioning brass instruments in the world. This is the only decorated chamber in the tomb, with scenes from the opening of the mouth ceremony (showing Ay, Tutankhamun's successor acting as the king's son, despite being older than he is) and Tutankhamun with the goddess Nut on the north wall, the first hour of Amduat (on the west wall), spell one of the Book of the Dead (on the east wall) and representations of the king with various deities (Anubis, Isis, Hathor and others now destroyed) on the south wall. The north wall shows Tutankhamen being followed by his Ka, being welcomed to the underworld by Osiris. Some of the treasures in Tutankhamun's tomb are noted for their apparent departure from traditional depictions of the boy king. Certain cartouches where a king's name should appear have been altered, as if to reuse the property of a previous pharaoh—has often occurred. However, this instance may simply be the product of "updating" the artifacts to reflect the shift from Tutankhaten to Tutankhamun. Other differences are less easy to explain, such as the older, more angular facial features of the middle coffin and canopic coffinettes. The most widely accepted theory for these latter variations is that the items were originally intended for Smenkhkare, who may or may not be the mysterious KV55 mummy. This mummy, according to craniological examinations, bears a striking first-order (father-to-son, brother-to-brother) relationship to Tutankhamun. The entire chamber was occupied by four gilded wooden shrines which surrounded the king's sarcophagus. The outer shrine measured 5.08 x 3.28 x 2.75 m and 32 mm thick, almost entirely filling the room, with only 60 cm at either end and less than 30 cm on the sides. Outside of the shrines were 11 paddles for the "solar boat", containers for scents, and lamps decorated with images of the god Hapi. The fourth and innermost shrine was 2.90 m long and 1.48 m wide. The wall decorations depict the king's funeral procession, and Nut was painted on the ceiling, "embracing" the sarcophagus with her wings. This sarcophagus was constructed in granite. Each corner of the main body and lid were carved from stone of different colours. It appears to have been constructed for another owner, but then recarved for Tutankhamun; the identity of the original owner is not preserved. In each corner a protective goddess (Isis, Nephthys, Serket and Neith) guards the body. Inside, the king's body was placed within three mummiform coffins, the outer two made of gilded wood while the innermost was composed of 110.4 kilograms (243 lb) of pure gold. Tutankhamun's mummy was adorned with a gold mask, mummy bands and other funerary items. The funerary mask is made of gold, inlaid with lapis lazuli, carnelian, quartz, obsidian, turquoise and glass and faience, and weighs 11 kilograms (24 lb). The Enigmatic Book of the Netherworld is a two-part ancient Egyptian funerary text inscribed on the second shrine of the sarcophagus. The term "enigmatic" here refers to it being written in cryptographic code, a New Kingdom practice also known from the tombs of Ramesses IX and Ramesses V. Its content is therefore not readily available to Egyptology; Coleman (2004) interprets it in terms of the creation and rebirth of the sun. The text is broken into three sections that incorporate other funerary texts, such as the Book of the Dead and the Amduat. The text is notable for containing the first known depiction of the ouroboros symbol, in the form of two serpents (interpreted as manifestations of the deity Mehen) encircling the head and feet of a god, taken to represent the unified Ra-Osiris. The treasury was the burial chamber's only side-room and was accessible by an unblocked doorway. It contained over 5,000 catalogued objects, most of them funerary and ritual in nature. The two largest objects found in this room were the king's elaborate canopic chest and a large statue of Anubis. Other items included numerous shrines containing gilded statuettes of the king and deities, model boats and two more chariots. This room also held two mummies of fetuses that DNA has shown to have been stillborn offspring of the king. The annex, originally used to store oils, ointments, scents, foods and wine, was the last room to be cleared, from the end of October 1927 to the spring of 1928. Although small in size, it contained approximately 280 groups of objects, totaling more than 2,000 individual pieces. Also found within the annex chamber were 26 jars containing wine residue. During the excavation it quickly became apparent that the tomb had been robbed in ancient times. The upper part of the door leading into the tomb had been damaged and repaired, with the symbol of the Royal Necropolis affixed. Behind it was a corridor carved through the bedrock filled with limestone chippings, which seemed to have been tunnelled through. A second door had also been penetrated and repaired at some point. 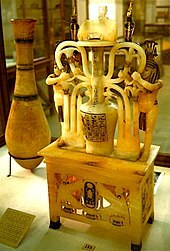 Parts of absent objects and traces of oils in empty jars led Carter to conclude that the tomb had been raided for gold shortly after Tutankhamun's burial, and again for expensive oils. The corridor had presumably been filled with debris after the first robbery, as the inner plaster door lacked the marking of the chippings that the repaired area demonstrated, indicating that it had dried before its placement. This debris had been tunneled through in a later robbery. The chippings also covered some fragments of looted articles including jar lids, razors and wood fragments that had been presumably removed from the antechamber and stored in the tunnel during the first robbery. Two sealed chambers leading from the antechamber—the annex and the burial chamber—had also been raided. The annex was probably worst affected by the first robbery. The room was small and full of densely packed items, which had been ransacked by a robber who had entered through a small hole in the outer door. The robber hurriedly disturbed the contents of the annex, emptied boxes and removed items. The robbers seem to have been looking for metals, glass (then a valuable commodity), cloth, oils and cosmetics. The robbery was fairly contemporary with the burial, as the lifespan of oils and cosmetics would have been limited. After this robbery was discovered, the doors were resealed and it is likely that the descending tunnel was filled with packed limestone chippings to deter future robberies. The second robbery required much more organisation to clear the descending corridor — a tunnel was dug in the top-left-hand corner of the tunnel, and the outer door was penetrated by a large hole in the blocking. Carter estimated that it would have taken a team of men around eight hours to excavate the tunnel by passing back baskets of rubble. The second robbery penetrated the entire tomb, and Carter estimated that around 60% of the jewelry in the treasury had been looted, along with precious metals. At some point, a knotted scarf containing a number of looted rings was dropped back into a box in the antechamber, which led Carter to the conclusion that the robbery had perhaps been discovered while it was in progress, or that the thieves had been pursued and caught. The tomb may have been hurriedly resealed (possibly to avoid drawing attention to the tomb) by the official Maya, as the signature of his assistant Djehutymose was found by Carter on a calcite stand in the annex. Upon resealing the tomb, the first and second resealings were marked with the same seal, bearing a design of a jackal over nine bound captives, which may indicate that they both took place within a short time interval after the closure of the tomb. Research by prominent Egyptologist Nicholas Reeves (attached to the University of Arizona) suggested, in 2015, that there may be areas of the tomb worthy of further analysis. Reeves investigated high-resolution digital scans of the tomb taken by Madrid-based company Factum Arte that were used in the process of creating a facsimile of the tomb. Reeves noted markings in the plaster of the burial chamber that appeared to suggest the possibility of a small door in the west wall of the burial chamber, of the same dimensions as the annex door. According to Reeves, markings on the north wall could also suggest that the wall itself may partly be a blocking wall covering a void, possibly indicating that the "antechamber" continues as a corridor beyond the north wall. Although the "doors" may just be uncompleted construction work, one possibility that has been suggested is that Tutankhamun is actually buried in the outer section of a larger tomb complex (similar to the tomb of Amenhotep III) that has been sealed off by the north wall, and that a further burial (possibly that of Nefertiti) may exist elsewhere in undiscovered areas of the tomb. In March 2016, a ground-penetrating radar scan revealed two empty spaces and what appear to be organic and metallic materials within them. However, researchers from the University of Turin used sonar to evaluate the tomb and found no evidence of any yet-unrevealed chambers, disproving this hypothesis. The Egyptian Ministry of State of Antiquities reviewed and accepted these results, which were presented in May 2018. KV62 in the Valley of the Kings. The tomb directly facing the camera is that of Rameses VI. In front of it and to the right, half-hidden by the shoulder of the central mountain, is the tomb of Tutankhamun. The tomb is open to the public at an additional charge to that of general admission to the Valley of the Kings. The number of visitors was limited to 400 per day in 2008. The tomb was closed beginning in 2010 while restoration work was undertaken by the Getty Conservation Institute. A replica of the tomb begun in 2009 was opened about a mile from the original in 2014. The Getty Conservation Institute completed its renovation in early 2019, marking the most significant restoration of the tomb to date. It is expected to continue accepting visitors. ^ "Tutankhamun". University College London. Retrieved 2007-06-10. ^ Christianson, Scott (November 5, 2015). "A Look Inside Howard Carter's Tutankhamun Diary". Smithsonian Magazine. Retrieved July 6, 2018. ^ a b Gilbert, Holt & Hudson 1976, p. 13. ^ "The Tombs of Tutankhamun and his Predecessor". Archived from the original on 2015-09-25. Retrieved 2015-09-24. ^ "Howard Carter's diaries (October 28 to December 30, 1922)". Archived from the original on June 30, 2007. Retrieved 2007-06-04. ^ "A. C. Mace's personal diary of the first excavation season (December 27, 1922 to May 13, 1923)". Archived from the original on June 30, 2007. Retrieved 2007-06-04. ^ "Howard Carter's diaries (January 1 to May 31, 1923)". Archived from the original on 2007-04-07. Retrieved 2007-06-04. ^ "Howard Carter's diaries (October 3, 1923 to February 11, 1924)". Archived from the original on 2007-04-07. Retrieved 2007-06-04. ^ "Howard Carter's diaries (September 24 to November 10, 1930)". Archived from the original on June 30, 2007. Retrieved 2007-06-04. ^ "KV 62 (Tutankhamen)". Retrieved 2007-06-10. ^ a b Reeves & Wilkinson 1996, p. 124. ^ a b c d e f g Andrews, Mark (2006). "The King Tut Tomb Robberies". Archived from the original on 9 February 2006. Retrieved 1 January 2018. ^ a b c d Gilbert, Holt & Hudson 1976, pp. 13–14. ^ Zahi Hawass: King Tutankhamun. The Treasures Of The Tomb. p. 16. ^ Finn, Christine (2011-04-17). "Recreating the sound of Tutankhamun's trumpets". BBC News. Retrieved August 8, 2012. ^ "Ghost Music". BBC Radio 4 Programmes. Retrieved August 8, 2012. ^ a b "KV 62 (Tutankhamen): Burial chamber J". Retrieved 2007-06-10. ^ Reeves & Wilkinson 1995. ^ Gilbert, Holt & Hudson 1976, p. 5. ^ "The Innermost Coffin of Tutankhamun". Eternal Egypt. 2005. Retrieved January 1, 2019. ^ Darnell, John Coleman (2004). The Enigmatic Netherworld Books of the Solar-Osirian Unity. Academic Press Fribourg / Vandenhoeck & Ruprecht Göttingen. ISBN 3-7278-1469-1 / ISBN 3-525-53055-2. ^ Hornung 1999, p. 77–82. ^ Hornung 1999, pp. 38, 77–78. ^ Gately, Iain. Drink. Gotham Books. p. 8. ISBN 978-1-592-40303-5. ^ Gilbert, Holt & Hudson 1976, p. 15. ^ Bohleke, Briant (2002). "Amenemopet Panehsi, Direct Successor of the Chief Treasurer Maya". Journal of the American Research Center in Egypt. 39: 157–172. doi:10.2307/40001153. ^ "The burial of Nefertiti ?". Retrieved 2015-09-24. ^ "King Tut's Tomb May Have Hidden Spaces Containing Organic, Metallic Materials". NPR.org. Retrieved 2018-02-26. ^ "Tutankhamun 'secret chamber' does not exist, researchers find". BBC. May 6, 2018. Retrieved May 6, 2018. ^ "King Tut's tomb not concealing hidden rooms after all". Associated Press. May 6, 2018. Retrieved May 6, 2018 – via NBC News. ^ "400 visitors to Tutankhamun's tomb". 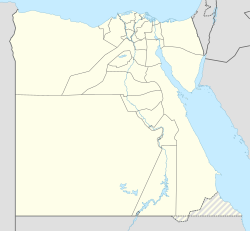 Egypt State Information Service. Retrieved 2007-11-13. ^ "Conservation and Management of the Tomb of Tutankhamen". Retrieved 2013-11-17. ^ Del Giudice, Marguerite (20 May 2014). "Tut's Tomb: A Replica Fit for a King". National Geographic. Retrieved 4 February 2019. ^ "Tutankhamon Tomb recreation". Euronews. Archived from the original on 27 November 2012. Retrieved 14 December 2012. ^ "King Tut's tomb unveiled after being restored to its ancient splendor". CBS News. 2 February 2019. Retrieved 4 February 2019. Hornung, Erik (1999). The Ancient Egyptian Books of the Afterlife (in German). David Lorton (translator). Cornell University Press. Gilbert, Katherine Stoddert; Holt, Joan K.; Hudson, Sara, eds. (1976). Treasures of Tutankhamun. The Metropolitan Museum of Art. ISBN 0-87099-156-6. Reeves, Nicholas C.; Wilkinson, Richard H. (1995) . The Complete Tutankhamun: The King, the Tomb, the Royal Treasure. Thames & Hudson. ISBN 978-0500278109. Carter, Howard & Mace, Arthur C. The Discovery of the Tomb of Tutankhamen. Siliotti, A. Guide to the Valley of the Kings and to the Theban Necropolises and Temples, 1996, A.A. Gaddis, Cairo. Wikimedia Commons has media related to KV62. This page was last edited on 10 April 2019, at 07:04 (UTC).